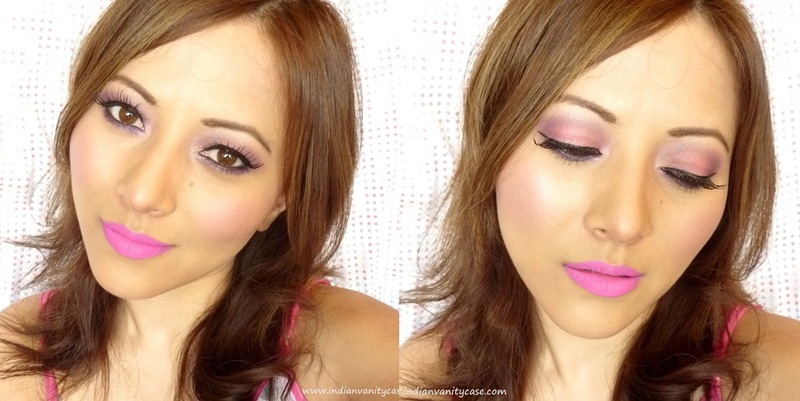 A "bubbly" look with MAC Quite Cute products: Candy Yum Yum Lipstick & Sakura Mineralize Blush. For photos & swatches, please click here. I love both products so very much! Face ~ Too Faced Primed & Poreless Primer, MUFE HD Foundation, Body Shop Loose Powder, Laura Mercier Undercover Pot, MAC Chromagraphic Pencil to conceal blemishes. Eyes ~ Pink & purple eyeshadows from BF 120 palette, Bloop shimmery pigment on inner corners, Maybelline Hyper Sharp Liner, Lotus Kajal on waterline, Maybelline Hello Kitty Cat Eyes Mascara on top & bottom lashes, False lashes. Brows- No.7 Eyebrow Pencil. That's my "I'm Happy" heart-shaped mirror. Meant for kids, but whatever... heehee...as if! "Catch it.... before it bursts. Just don't watch it fly away." You look so beautiful. Both products really look great on you, and I love your hair. Such a fun, vibrant look! You have such exquisite, fine features! dreamlike! that lipstick suits you to the T! Oh so beutifull I love the colours you used. Could you please tell me what product you used in yours cheek ? wow... 1st pic is luvly... n eye make up is grt... lipstick looks bright.. OMG...!! U look soo super cute...!! <3 love it girl soo pretty and fun! its definitely over-the-top but it really suits you :) and as always fabulous snaps!!! Gorgeous n cute are the only words popped of my mind.. I have been a silent reader of ur blog Cynthia, since past 6-8 months. U simply rock gal.. Classy n fabulous.. What perfection!! Cheers.. Are you makeup artist?? The lisptick shade is sooooo lovely. I bought sth like this too but mostly tone it down by mixin some brown.You pulled it off so nicely! This definitely shows what the Quite Cute collection was all about. You made it (somewhat) wearable and I think it's adorable! The mirror is cute! And I love the eye look. The lipstick is not my color. Siri- awww....ur too sweet! Thank u.
Dr.Shivani- hehe...good choice of words. Muahhh! You look quite cute <3 the lipstick is totally working for you!! So if it happens in future you know you have no choice left as I already booked it in advance .. I love everything about this look! Love your pink lippy! That heart shaped mirror and your dress are just super pretty! Beautiful shots,nice makeup and your mirror is so lovely,I like it,you've done a great work..